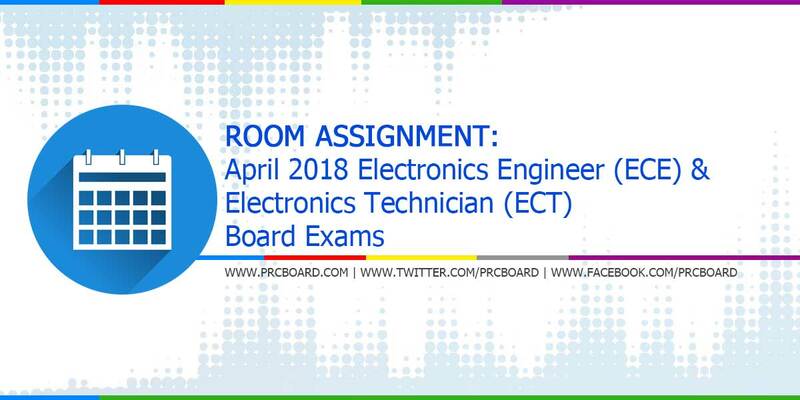 MANILA, Philippines - The Professional Regulation Commission (PRC) Board of Electronics Engineering released the April 2018 Electronics Engineer (ECE) and Electronics Technician (ECT) room assignments few days before the licensure exam. The ECE and ECT board exams are scheduled to take place on April 4-6, 2018 at PRC testing centers in Manila, Baguio, Cagayan De Oro, Cebu and Davao. Electronics Engineering is one of the programs with average number of examinees being administered by PRC. On the most recent board exams conducted October 2017, 2,235 out of 4,784 passed the ECE while 2,916 out of 3,258 passed the ECT. On April 2017, 1,033 out of 2,503 passed the ECE and 1,020 out of 1,273 passed the ECT while on October 2016, 1,914 out of 4,742 passed the Electronics Engineer and 2,722 out of 3,642 passed the Electronics Technician. To receive regular updates about April 2018 ECE and ECT board exam results as well as other related announcements, you may refer to our social media pages via Facebook and Twitter.